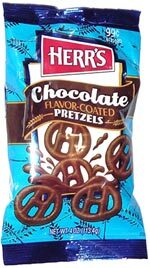 Taste test: These are pretzels shaped like an H (as in Herr's) surrounded by a circle, coated in chocolate. They've got roughly equal amounts of chocolate and pretzel taste. The pretzel helps to temper the taste so that they're not too sweet, so it does play a good supporting role. 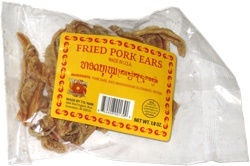 The taste nearly isn't nearly on par with the fancy chocolate-coated pretzels you would get at a fancy candy shop, nor with the chocolate-coated pretzels from Beny Bigolos, but they're still pretty good. Smell test: Smells like hot cocoa.